Did Any of Our Ancestors Own Slaves? 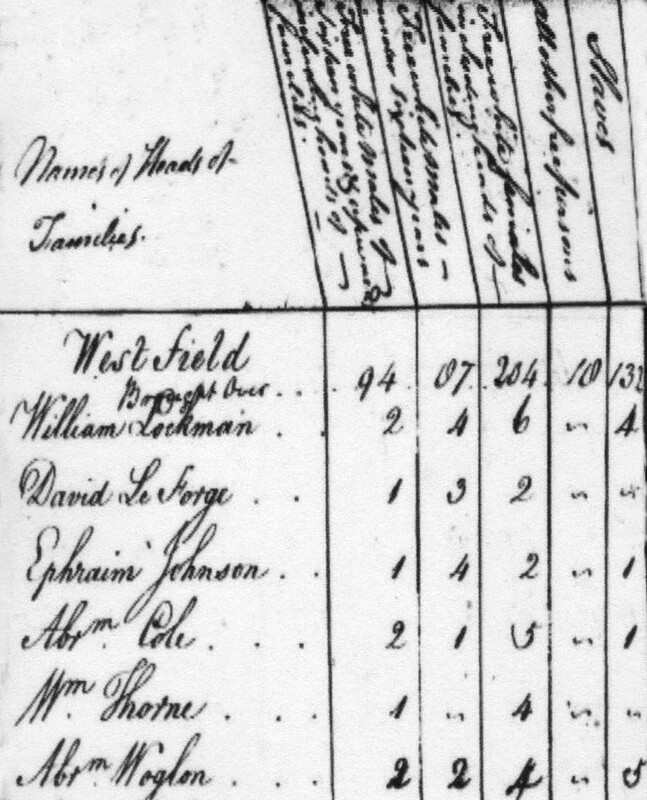 Abraham Woglom’s five slaves are recorded in the right hand column of this page from the 1790 U.S. census of Westfield, Staten Island. With roots in America going back to the colonial era, the question becomes inevitable: Did any of our ancestors own slaves? The serious research of family genealogy means accepting the good and the bad, the expected and the unexpected. The uncomfortable truth is, yes, there are confirmed slave owners in our family tree. Abraham Manee (1747-1824; 8th great-grandfather of Richard, et al.) is shown in the first United States census, taken in 1790, as owning two slaves on his farm in Westfield, Staten Island. Abraham Woglom (1759-1799; 6th great-grandfather of Richard, et al. ), also of Westfield, is shown as owning one slave in the 1790, 1800 and 1810 U.S. census. His father, also named Abraham (1731-? ; 7th great-grandfather of Richard, et al. ), owned five slaves in 1790, four in 1800 and an unspecified number in 1810. Both John Lay (1717-1792; 7th great-grandfather of Richard, et al.) and John Sill (1710-1796; 7th great-grandfather of Richard, et al.) are shown in the 1790 U.S. census as having one slave in their households in Lyme, Connecticut. We can render no judgment on these people for living in the times they did, nor can we limn their personal beliefs or their attitudes toward their slaves from the circumstantial record. Slavery was a tragic fact of life in colonial America, and these people lived there. Slavery was abolished in the state of New York in 1827 and in Connecticut in 1848. WOW…not surprised though…slavery actually was popular in the north…I like the way you acknowledged our ancestors without apology….it was wrong and always will be, but that was the custom in those days….some future generation will look back on US and wonder how we could not have known something we are doing now was wrong. Those future generations will have plenty to talk about, for sure. “We can render no judgment on these people for living in the times they did, nor can we limn their personal beliefs or their attitudes toward their slaves from the circumstantial record.” So beautifully put, so measured and mature. What a welcome relief to the usual rants and raves. We all shared in and economically benefited from this aspect of our nation’s history, whether our individual ancestors owned slaves or not. What I appreciate most about this entire site is how you put your family story into the larger historical context. I am trying to do this for my family, but it is a poor stepchild to your abilities.You have done a remarkably professional job on the presentation, too – the graphics, the fonts, the research, everything. So impressive. I arrived at your site in researching Anabel Kinsey and Abraham Woglom (or really, Abraham’s brother John who married Elizabeth Reckhow). I was wondering how you came to the conclusion that Abraham (1731 – ?) is the father of your Abraham Woglom (and therefore my John, born c. 1760). Charlotte Hix has the father simply as “John Sr”. I am trying to make the connection to the Woglams of Perth Amboy, NJ. but there is a generation missing as most old genealogies have John B. Woglam (mine) born after the death of his supposed father John Ary Woglom. There are so many wrong conclusions draw about these middle generations of the Wogloms, especially in the early genealogies. As they all have sons John, Abraham, Cornelius, etc., it seems impossible to get it straight. I don’t want to perpetuate the misinformation. Thanks so much for any light you can shed. And even if you can’t, thanks for this wonderful site – I have enjoyed just browsing here!! Thank you very much! I have sent you a private email with additional information.